By the end of the 1860s the block of Lispenard Street between Broadway and Church Streets had seen the encroachment of commerce. Decades later, in 1919, Henry Theodore Lutz described the block in his article, "Reminiscences of the Fifth Ward," in Valentine's Manual of Old New York. His family moved into No. 56 Lispenard, he said, in 1861. "The house was owned and the lower part occupied by a French jeweler, Mr. Victor Marchand. Next door was Moon's stable, where the express wagons of Harndon's express were kept, and next to 58 was John Ireland's chop house, occupying 60 and 62." Victor Marchand's house and shop would not last many more years. On May 17, 1867 The New York Times remarked on what it called the "extraordinary transformation" of the neighborhood. The newspaper attributed the construction boom to the "vast fortunes accumulated during the war by down-town traders." Included in the long list of structures under construction was No. 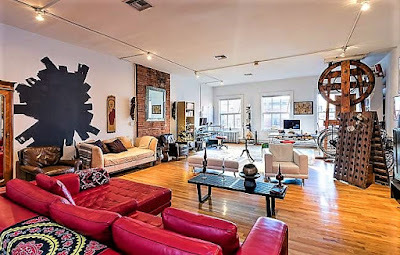 56 Lispenard Street. Construction had started in August of 1866. The newspaper placed its cost at $25,000 (about $418,000 today) and identified its owner as Judson & Leary. And there the mystery begins. The arcane partners were possibly dry goods dealers or merely two businessmen dabbling in real estate. The Landmarks Preservation Commission simply describes them saying "about whom nothing is known." Equally puzzling is their architect of record, J. Van Riper. If, indeed, Van Riper drew the plans for the structure, he most likely drew his inspiration entirely from style books. His listed profession was not architect, but contractor; a partner in J. & J. Van Riper, "masons and builders." The building was completed in 1868. The four-story, brick-faced Italianate style structure was a humble bedfellow among its rather grand stone and cast iron neighbors. The three floors above the cast iron storefront, manufactured in the foundry of Tice & Jacob's, appeared more domestic than commercial. The bracketed cast metal cornice and the stone lintels could have as easily appeared on a middle-class house. If Judson & Leary ever occupied their new building, they do not appear in directories and were most certainly gone by 1869 when the newly-formed Arnold & Banning moved in. Listing itself as "dry goods and commission merchants," Arnold & Banning represented firms like the Connecticut-based Harmon, Baldwin & Foy. 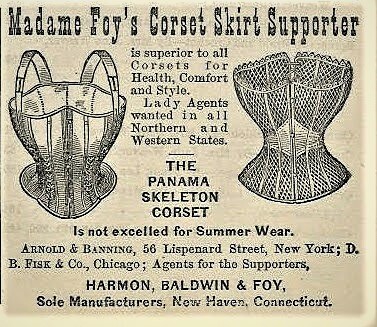 For years Arnold & Banning would market that company's Madame Foy's Corset Skirt Supporter. The first Arnold of Arnold & Banning was Edward Arnold, whose brother, Franklin, joined the firm in 1871. Edward diversified his business interests when he became an officer in the Day Manufacturing Co around 1874. Manufacturers and dealers in silk, the firm's offices and showrooms moved into No. 56 as well. Its silk mills were in Paterson, New Jersey. Edward and Franklin were not the only members of the Arnold family in the building. At the time Pennsylvania was the site of America's first oil boom as "rock oil" was discovered throughout the state. The machines of the Industrial Revolution had made petroleum highly valuable for purposes like lubrication. Around 1866 the Shafer Farm Oil Co. was founded in Pennsylvania and by 1876 its offices were in No. 56 Lispenard Street. Daniel S. Arnold was its treasurer. The following decade the Arnolds and their various business were gone, replaced by apparel manufacturers. M. Bouton made "cloaks" here as early as 1887; and E. Biesenthal & Co., owned by Edward Biesenthal and Morris Kirstein, manufactured wrappers. 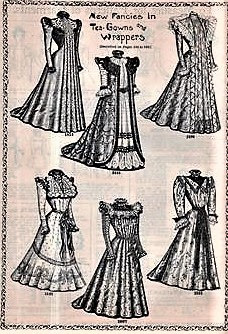 Also known as "tea gowns," the ornate dressing gowns were made to be worn over petticoats. Tailored to fit like a dress, women arising in the morning might even wear them to the breakfast table without risking her respectability. In 1898 there were three tenants in the building--A. Schuler & Co., maker of shirtwaists; Nathan Schwenk (who had started his men's neckwear business the year before); and Louis Baerlein & Co., wholesale dealers in hosiery, "furnishing goods" and gloves. Founded in 1870, Louis Baerlein & Co. moved here from No. 540 Broadway, several blocks to the north. In 1908 Samuel L. Abrams had been a partner with his father in the menswear company M. H. Abrams & Son at No. 38 Walker Street. But there appears to have been some discontent within the family that year. Men's Wear magazine noted on June 10 that he had left the company and his brother, Jacob, had taken his place. The article said that Samuel had "started in business for himself at 56 Lispenard street." S. L. Abrams manufactured men's pants and would remain in the building for decades. It was joined by 1910 by dry goods jobbers L. Kleban & Co. and Schey & Co. Apparel and textile related firms continued to lease space following World War I. Sharing the building in 1918 with S. L. Abrams were The Washington Mills, jobbers of men's wear, and Morris L. Polansky, "silks, trims, and woolens." By mid-century the nearly century-old building was suffering from age and neglect. In 1962 Department of Building documents listed a store on the ground floor, but demanded that "above floors to remain vacant," most likely because of safety reasons. The Tribeca renaissance made its first mark on the brick building in 1978 when Gibby Goldbas's Loft opened. The tiny off-Broadway theater offered original stagings, like the double bill in January 1979. Gibby Goldbas's own Ghosttown was followed by Stuart Sherman's 11th Spectacle. Tickets were an affordable $2.50 each. Three years later a renovation of the upper floors resulted in one spacious apartment on each. As had been the case since 1868, the ground floor was home to a store. In 2007 Custom Frame Factory, a discount art frame store, was in the space. The somewhat time-worn appearance of the exterior belies the upscale residential spaces inside. Where once young immigrant girls sewed together women's tea dresses and men's pants, occupants live in much more comfortable surroundings. And the great mystery of who built the structure remains unsolved.